Pink and Black my shoes are killing me button badge. After a long night of dancing & enjoying the Party / Wedding is it time to kick off those high heel shoes. 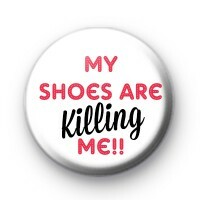 The perfect button badge for your hen night or wedding day.